Marc Davis is probably the world’s most beloved unknown man. Marc’s fabulous career spans over 60 years, including 43 years at Disney. In 1988, Marc was officially designated a “Living Legend” by The Walt Disney Company which is the highest honor that can be bestowed upon a Disney artist. storytelling abilities in many of their most popular theme park rides. His contributions to It’s A Small World, The Haunted Mansion, and The Pirates of the Caribbean have enchanted millions of visitors. His talent is timeless and future generations will surely cherish his genius as we do today. encountered during his travels. Marc was so intrigued by the art and culture of Papua New Guinea that he created over 400 works of art which capture forever the beauty and mystery of this disappearing world. Since Marc is also an avid collector, he has a special affinity for collectors and understands the difficulties in building an outstanding collection. 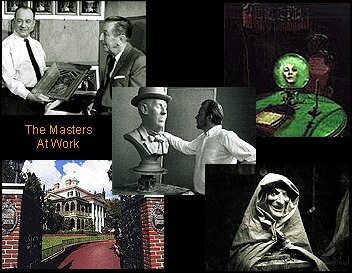 That is why he has agreed to open his vaults to The Official Marc Davis Collectors Society. From time to time Marc will hand pick previously unavailable works of art that will be made available to members only. All works will be numbered and signed for limited distribution. The Marc Davis Collectors Society is both the key and the vehicle through which Marc Davis treasures will be made available to the public. The organization has a charter that allows only 5,000 founding members worldwide making the membership itself a collector’s item. 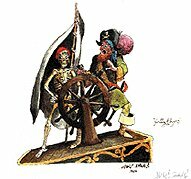 Founding members receive a hand-signed print of the “Jolly Roger”, a pirate character which Marc and Walt Disney considered for their walk-in attraction, The Pirates of the Caribbean, before it became the ride. This rare item will never be available through normal Disney channels in any form. A one-time membership fee of $275 secures your lifetime membership into this exclusive organization. Benefits include quarterly newsletters, a membership card and certificate, and an invitation to the annual convention. Whether you are a Disney buff or a fine art collector this is the opportunity of a lifetime. To join the Marc Davis Collectors Society or to learn more about Marc’s life and works, visit The Official Marc Davis Collectors Society web site. Membership may also be procured by calling (818) 347-4837 or fax to (818) 347-4793.